The incoming senior officials to which the passage refers are Fatou Bensouda of Gambia, elected the ICC Prosecutor effective mid-2012, and Chile Eboe Osuji of Nigeria, who has been serving as Legal Advisor to the Office of the U.N. High Commissioner of Human Rights and was elected an ICC judge in December. ► Fulfillment by states parties of their obligations under the ICC treaty to implement warrants and decisions of the court. The letter urged further development of national justice systems so that they might pursue persons accused of the core crimes that ICC now prosecutes – genocide, crimes against humanity, and war crimes – domestically, as envisaged by the ICC Statute's complementarity principle. Great to see this letter being discussed. It's significant not only because, as you noted, it was a joint effort of NGOs based across the continent (disclosure: my organization signed), but also because the recommendations to the African states parties to the ICC were wholly constructive and veered away from criticizing the AU decision of last year urging states not to cooperate on arrests etc. This approach from civil society shows an understanding that it is going to take time and sincere efforts at persuasion to show many states that perceptions of the ICC as a hegemonic tool of the north are incorrect. There are many African states parties to the Rome Statute that support the ICC strongly - for example, Botswana which used its keynote address at the last Assembly of States Parties in December 2011 to urge states to recognise non-cooperation for what it is: "a serious setback" to dealing with impunity in Africa. 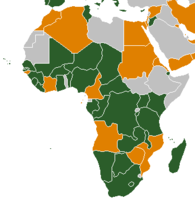 These states need to find their voice within the African Union to bring the discussion back to what remains the essential point: Africa as a whole is a great supporter of the ICC - and civil society too must continue to find ways to demonstrate and reinforce this point. Thank you for your valuable comment, Stephanie. The Botswana speech you mention is described at http://www.taiwannews.com.tw/etn/news_content.php?id=1785522, and analyzed by South African jurist Max du Plessis at http://allafrica.com/stories/201112140789.html. In similar vein was the "Pro-ICC pushback" at a conference in Botswana last July, about which we posted at http://www.intlawgrrls.com/2011/07/pro-icc-pushback.html.